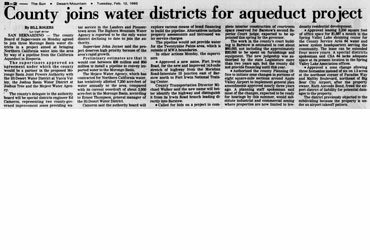 YUCCA VALLEY – The California Public Utilities Commission today declared the Mount San Gorgonio Water Co. to be public utility water corporation. 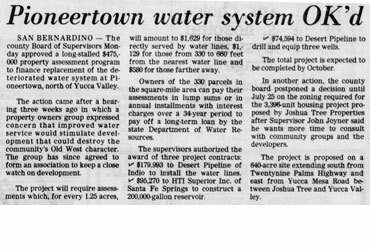 The company was ordered to submit within 90 days a written plan for the development of a satisfactory water system to the Pioneertown and Rim Rock area near Yucca Valley, or in the alternative, a plan for diverting itself of a well and well sites. The decision followed several days of public hearing in Yucca Valley on a complaint by the Rim Rock Property Owners Assn. 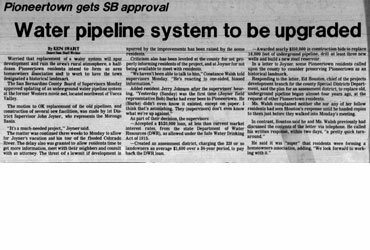 against Pioneertown Utilities Co., Pioneertown Corp., Mount San Gorgonio Water Co., and several individuals. The decision recited the history of Pioneertown and Rim Rock developments. More than 10 years ago, according to the decision, a corporation known as Pioneertown was formed to subdivide and sell land in San Bernardino County. The corporation sold lots in Section 19, known as Pioneertown and Section 3, known as Rim Rock. The decision pointed out that Pioneertown Corp., now defunct, borrowed money from William Murphy, Fletcher Jones, and Charles Nichols. Nichols died Dec. 15, 1958. The decision said Pioneertown Corp., defaulted and the lenders acquired land in Sections 19 and 3 for the indebtedness and this land was transferred to the San Gorgonio Water Co. The Rim Rock Property Owners Assn., consisting of most of the 13 users in the Rim Rock area, alleged in their complaint they purchased their property from the Pioneertown Corp. with the understanding the corporation would furnish water. Since Pioneertown Corp., defaulted, Rim Rock residents have been receiving water from a surface spring which flows into a pipe installed by the owners of the Rim Rock Motel.